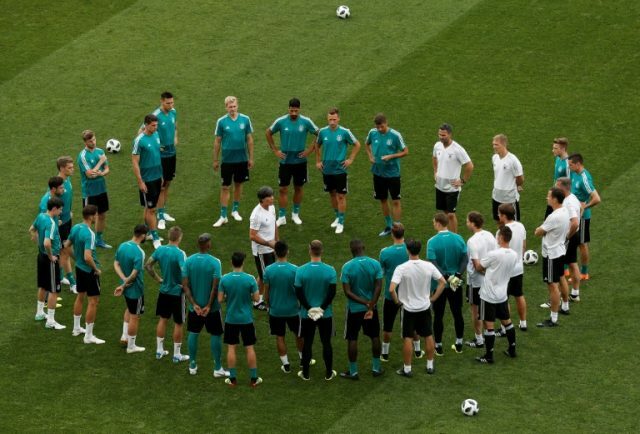 Germany can ill afford another slip-up when they take on Sweden at the World Cup on Saturday, as the defending champions attempt to follow Brazil’s lead by belatedly springing into life. Joachim Loew’s side slumped to a 1-0 defeat against Mexico in their opening Group F match, paying the price for a calamitous first half in a performance that drew stinging, widespread criticism. Lothar Matthaeus, the 1990 World Cup-winning captain, said he hadn’t seen a Germany team “so weak at a big tournament for a long time” following the loss in Moscow. “Everyone is ready to fight for their lives,” said striker Timo Werner, who is again set to lead the Germany attack. With 10 World Cup goals to his name, Germany will also expect more from Thomas Mueller at his third finals appearance. “The pressure is terrifically high, but we won’t win both games if we beat ourselves up internally and look for the mistakes in each other,” said Mueller, with Germany to meet South Korea in their final match. Sweden beat the Koreans 1-0 to join Mexico at the top of the section, but a stomach bug has prevented three players — Pontus Jansson, Filip Helander and Marcus Rohden — from travelling to Sochi. Brazil, one of several contenders to make a slow start in Russia, left it late before finally overcoming a plucky Costa Rica 2-0 on Friday. Neymar won a penalty before referee Bjorn Kuipers reversed his decision after he consulted the video assistant referee, the first time a spot-kick award has been chalked off at the tournament. Philippe Coutinho broke the deadlock in the 91st minute, with Neymar volleying in a second with virtually the last kick of the game. Brazil must pick up at least a point against Serbia next Wednesday to be assured of progressing, with Switzerland also in a strong position in Group E after Xherdan Shaqiri’s 90th-minute winner in a 2-1 victory over Serbia. Argentina received a lifeline in Group D as Ahmed Musa’s brace sealed a 2-0 victory for Nigeria over Iceland, who saw Gylfi Sigurdsson sky a VAR-awarded penalty. Lionel Messi and company looked down and out after capitulating against Croatia, but a win over Nigeria on June 26 could send them through as runners-up. Romelu Lukaku and Belgium can effectively lock up a last 16 berth with victory over Tunisia in Moscow in Group G, ahead of a blockbuster clash with England next week. Lukaku scored twice in a 3-0 win over debutants Panama, and Roberto Martinez is trying to finally squeeze the best out of a squad brimming with talent. “The World Cup does not respect generations, the World Cup doesn’t respect individual names, it only respects winning teams,” Martinez said. Mexico head into their showdown with South Korea after a “milestone” win over Germany, but a misstep in Rostov-on-Don would undo all that good work. “I had a suspicion the Asian teams in this World Cup would do well and I had the idea that we would do well as an Asian team too,” midfielder Jung Woo-young said.